Cat owners make a mistake of feeding cheap and local food to their cats, not thinking once that it can be harmful to their cat. We suggest you to read about what cats need and how poor diet can affect them. A poor cat diet can lead to many diseases and shorten the life span of a cat. Do not risk your cat’s life to save just a few pennies. Here we have got something for you to feed to your cat; buy it while it is discounted! 9Lives® is a nutrition cat food company provider. They love healthy cats and have a range of food for them. There two most famous packs are of 9Lives Daily Essentials and 9Lives Plus Care. There website also has a lot of information about why it is necessary for you to give the right food to your cat, and how 9lives can help you with it. 9Lives® is giving a $1 off coupon to anybody who likes their Facebook Fan page, ‘Morris the Cat.’ Isn’t that great? The deal is applicable on their most famous packs, the Daily Essentials and Plus Care. 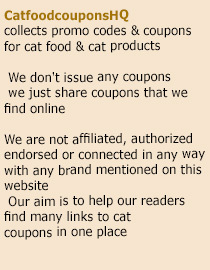 So hurry up and like their Facebook page and get a bag of cat food for your cat. This entry was posted in 9Lives. Bookmark the permalink.